Maximuscle Progain flapjacks are a high protein flapjack packed with complex carbohydrate and added creatine. Progain flapjacks are a convenient snack alternative that contains 20 g protein✝ in every great tasting bar. For individuals looking for muscle growth - protein is the key. 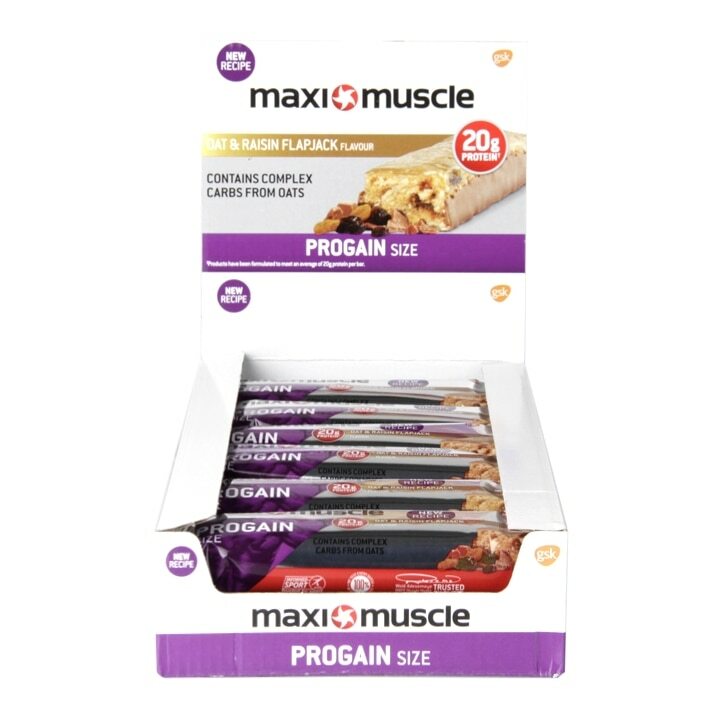 Maximuscle Progain flapjacks offer a convenient way to boost the protein content of your diet whilst providing complex carbohydrate and added creatine to support repeated bursts of high intensity exercise (when a minimum 3g of creatine are consumed per day). Each bar is 90g. Oats (33%) (rolled oats, wholegrain toasted malted oats (barley malt extract, palm oil)), humectants (E422, E965), milk protein, hydrolysed collagen, milk chocolate couverture (8%) (sugar, cocoa butter, whole milk powder, cocoa mass, emulsifier: soya lecithin, flavouring), raisin (5%), water, creatine monohydrate, inulin, honey, flaxseed, sunflower oil, flavourings, whey protein concentrate (milk), salt, antioxidant (E306). May contain wheat, egg, peanuts & other nuts. Enjoy as part of a balanced diet and healthy lifestyle. Excessive ocnsumption may produce laxative effects. May contain wheat, barley, oats, egg, peanut and other nuts. MaxiMuscle Progain Bar Oats & Raisins is rated 4.2 out of 5 by 5. Rated 3 out of 5 by Idonthaveone from Tasty treat I only bought it try the difference from my other chocolate treats. It was not as sweet and if I was on a diet this would replace the chocolate treats. Rated 3 out of 5 by Izzy31 from Sweet & Sticky I tried these bars an an alternative to the discontinued chocolate, raisin, hazelnut version. I was pleased with the flavour of the new bar. The chocolate coating on the base is smooth. The taste of honey is strong. The bars are extremely sweet. The bar texture is fairly soft and easy to chew. It has dense mixture of fine oats and whole raisins. The bar is similar to a flapjack. It is glazed, giving it an shiny appearance. Overall, the bars are slightly artificial. They taste good but I don't feel they are highly nourishing. They are inferior to the chocolate raisin, hazelnut version, both on terms of taste and the energy they provide.